This article is about Bowser Jr.'s appearance in Super Smash Bros. Ultimate. For the character in other contexts, see Bowser Jr..
Bowser Jr. (クッパJr., Koopa Jr.) is a playable character in Super Smash Bros. Ultimate. He was revealed for the game along with the rest of the veterans on June 12th, 2018. He returns with his Junior Clown Car, and the Koopalings also return as his alternate costumes. Bowser Jr. is classified as fighter #58. 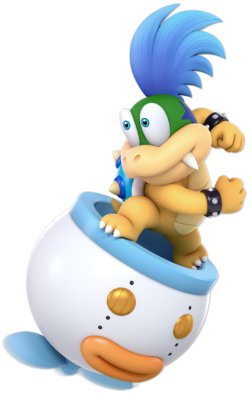 As in Smash 4, Caety Sagoian's portrayals of Bowser Jr. in the Mario games were repurposed for Ultimate. In addition, Lani Minella’s portrayals of Larry, Morton, Wendy, and Lemmy, Mike Vaughn’s portrayals of Iggy and Ludwig, and Dan Falcone’s portrayal of Roy from the New Super Mario Bros. games that were used in Smash 4 were also repurposed for Ultimate. 6 Classic Mode: Mama Peach, Where Are You? Play VS. matches, with Bowser Jr. being the 61st character to be unlocked. Clear Classic Mode with Fox or any character in his unlock tree, being the sixth character unlocked after Daisy. Have Bowser Jr. join the player's party in World of Light. With the exception of the third method, Bowser Jr. must then be defeated on Delfino Plaza. Bowser Jr. is a unique heavyweight in the sense that, his Junior Clown Car has a separate hurtbox from him, making his survivability variable. Bowser Jr. has the sixtieth fastest walking speed, sixty-second fastest dashing speed and initial dash, twenty-sixth fastest air speed, thirty-first highest air acceleration, thirty-fourth highest gravity, the twenty-eighth fastest falling speed and fast falling speed, and the sixty-eighth highest traction. As a result of these attributes, Bowser Jr.'s mobility is merely average in most cases, though many characters supersede him in terms of approach. Bowser Jr. possesses a unique mechanic, in which, his Junior Clown Car takes less damage from all incoming attacks. This, coupled with his high weight, gives Bowser Jr. potentially above-average survivability compared to other characters, and even other heavyweights. Bowser Jr. also possesses a purely disjointed moveset and two good projectiles in Clown Cannon and Mechakoopa, giving him a ranged gameplan. Clown Cannon can have two cannonballs in play at the same time, deals good damage and knockback, and its cannonballs travel quickly. This, as a result, makes Clown Cannon good for disrupting or throwing off approaches, as well as KOing at high percentages. This is further compounded by its outstanding shield damage, making Clown Cannon a viable punishing tool. Mechakoopa is also disruptive in its own right, due to its explosion that is induced from hitting it. The Mechakoopa always follows opponents no matter the circumstances, and explodes upon contact, serving as an excellent KO setup against launched opponents. 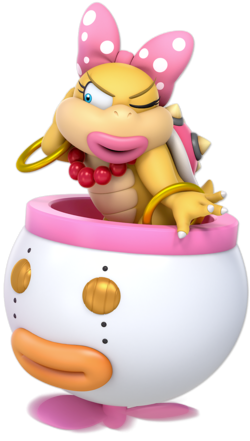 While Bowser Jr. did not receive as many direct changes to his standard moveset compared to the rest of the cast, he did obtain some notable improvements due to his attributes and special moves. One of the biggest changes include the Junior Clown Car now taking priority over Bowser Jr.'s hurtbox, making him unique as he will now take less damage on average compared to any other fighter. He also benefits heavily from the universal frame 3 jumpsquat, allowing him to use his formidable aerials more effectively. Bowser Jr.'s mobility is also better, due to his higher walking, dashing, and air speeds; his increased dashing speed contributes to a better grounded approach, while his increased air speed slightly aids his air game and recovery. His up tilt and grab's infamously misleading hitboxes have been fixed (with the latter being given more range). Up throw is now capable of starting combos (albeit still limited), while his down throw now deals more damage, patching his previously lackluster grab game. His special moves, previously notorious for their lag and/or situational use, have been buffed significantly. Clown Cannon, a previously slow projectile with limited use, is now less punishable due to its decrease in lag and increase in lifetime if fired in the air, and two can be in play at once. It also deals far more shield damage; an uncharged landing cannonball can now hit twice to almost break a full shield. Clown Kart Dash allows Bowser Jr. to keep his double jump if cancelled, no longer requires travel time to deal maximum damage and immediately deals higher damage if the directional key is held forward, while its spinout deals far more knockback, making the move harder-hitting in general. Mechakoopa has had its lag reduced and the Mechakoopas start moving quicker; it also bites onto victims, guaranteeing that the second hit will connect. Finally, Abandon Ship! 's hammer swing is faster, at the expense of the exploding kart having less knockback. However, Bowser Jr. has received some notable nerfs, including a significantly less damaging neutral attack, a sourspot on his forward tilt, and the removal of air dodging out of Clown Kart Dash. In addition, he retains many former flaws that are still notable, including his extremely gimpable recovery and, despite being buffed, a below-average set of throws. Overall, Bowser Jr.'s moveset and attributes have been retooled to be more consistent and significantly less situational that in Smash 4, allowing him to zone opponents more effectively. As of now, it is unknown how his changes will affect him compared to the rest of the cast. As with all veterans returning from SSB4, Bowser Jr.'s model features a more subdued color scheme. Like his father, his horns, hair, and spikes feature simple detailing, but his scales remain undefined and his body is not as monotone. The new detailing is also expressed by the Koopalings. The Junior Clown Car's color scheme is also more subdued. In addition, the inside of the Junior Clown Car now contains a control panel. The Junior Clown Car is more expressive, with new facial animations when Bowser Jr. gets hit and when he misses a grab. The Koopalings are more emotive than before, with their eyes and mouths animating somewhat differently from Bowser Jr.'s. Previously, only Lemmy had unique expressions. Instead of a hammer, the Koopalings pull out their respective wands from Super Mario Bros. 3 and the New Super Mario Bros. games. Bowser Jr. has a different pose during air dodge. Bowser Jr. now grabs the ledge with one hand as opposed to two, and has a panicked expression on his face. Bowser Jr. has an animation for grabbing the ledge without the car. Like all characters, Bowser Jr.'s jumpsquat animation now takes three frames to complete (down from 6). Bowser Jr. runs faster (1.424 → 1.566). Bowser Jr.'s initial dash is faster (1.6 → 1.76). Bowser Jr. walks faster (0.88 → 0.924). Bowser Jr.'s Clown Car hurtbox takes priority over his body hurtbox, meaning that the opponent has to intentionally aim for his head to deal increased damage. Because of this, Bowser Jr. takes less damage from attacks than any other character. Hit 2 has less ending lag (FAF 40 → 30). The looping hits have less startup lag (frame 10 → 4) and a faster rehit rate (frames between hits: 4 → 2). The last hit deals more knockback, has less startup (frame 8 → 7) and ending lag (FAF 44 → 39) and a bigger hitbox. First hit and looping hits deals less damage (first hit: 3% → 2%, loop: 2% → 0.5%). Forward tilt has less ending lag (FAF 34 → 32). Forward tilt has a sourspot that deals less damage (8% → 6%). Up tilt's blind spot between the fork's prongs and the Junior Clown Car has been removed, it can hit prone or crouching targets. Down tilt deals more total damage (8% → 10%). The first two hits can be escaped from with SDI at very high percents. Down tilt can consume healing items, like food. Dash attack deals more total damage (11% → 13%). Dash attack hits connects more reliably. Dash attack has less ending lag (FAF 50 → 48). Forward smash's final hit has slightly less startup lag (frame 36 → 35) making it connect more reliably from the looping hits, though opponents still sometimes fall out. Up smash has less ending lag (FAF 57 → 54). All aerials have less landing lag (Neutral: frame 18 → 9, Forward: 27 → 16, Back: 24 → 14, Up: 15 → 9, Down: 25 → 15). All hitboxes of neutral aerial deal more damage (clean: 6% → 8%, mid: 5% → 7%, late: 3% → 5%). Forward aerial no longer has a sourspot. It has also lost the late hit that deals 5%, making the weakest possible hit the previous sourspot's middle hit (7%). Looping hits deal more damage (1.3% → 1.5%) and have 1 less frame of lag between each hit, making them connect more reliably. Final aerial hit deals more damage (2% → 2.5%). Bowser Jr. preemptively pulls out his toy hammer in his grab animation, and will look dejected if it misses. Standing grab has more range, actually matching the hitbox of the Junior Clown Kart's claw instead of stopping before the middle of the claw. Pummel's animation is slightly different. It deals less damage (2% → 1.2%), but is faster. Forward throw's second hit deals more damage (6% → 7%; 10% total) and knockback, increasing its KO potential. Back throw deals less damage (12% → 11%), with knockback compensated. Up throw has less ending lag (FAF 45 → 38) and less base knockback, granting it combo potential. Down throw deals significantly more damage (6.5% → 12.4%) and is a semi-spike, allowing it to set up for edgeguards. Edge attack deals more damage (7% → 10%). Clown Cannon's cannon balls travel in a spiraling path, similar to ones fired by Shotzos, instead of flying straight. Clown Cannon's charging animation has been altered to be more similar to smash attacks. When fully charged, the animation stops, giving a better indication of its charge time. Clown Cannon always has 6 frames less startup and 8 frames less ending lag, regardless how long it was charged. Two cannonballs can be in play at once. Aerial cannonballs keep an active hitbox indefinitely even once it starts falling in midair, allowing them to be used for edgeguarding. This does not apply for cannonballs that have already landed. Cannonballs deal more damage uncharged (early: 8.5% → 10%, late: 5.9% → 7%). Clown Cannon's cannonballs deal significantly more shield damage, capable of doing more than half a shield's health when fully charged. Uncharged cannonballs travel slower, letting one follow it. This makes it easier to dodge, but grants new setups based around the cannonball. This significantly improves its utility, as it was a very situational projectile in Smash 4. Due to the increase to the cannonball's shield damage and reduction in its flying speed, an uncharged cannonball can hit twice before it drops at maximum distance, dealing extreme shield damage. This gives Clown Cannon powerful, newfound shield-pressuring abilities. Fully charged cannonballs deal less knockback. Clown Kart Dash's spinout has less startup lag (frame 5 → 3). After cancelling Clown Kart Dash, Bowser Jr. keeps his double jump. Clown Kart Dash's collision damage no longer scales based on duration traveled, and is affected by whether the directional key is held: holding forward immediately increases damage and speed, while pressing no buttons gradually reduces damage and speed. As a result, the move deals more overall damage, since it no longer requires travel time to attain maximum damage. Clown Kart Dash's damage numbers have been reversed, with the early hits dealing up to 7.3%, and a non-accelerating late collision dealing 4%. Clown Kart Dash's spinout deals much higher damage (no acceleration: 8% → 10%, full acceleration: 8% → 16.3%). Its knockback has also been increased, making it much better for damage racking and KOing. Clown Kart Dash can no longer be airdodged out of. Clown Kart Dash makes Bowser Jr. jump higher on sloped platforms. Abandon Ship! 's Hammer Swing is faster. Abandon Ship! 's explosion has less knockback. Mechakoopa starts walking earlier (frame 54 → 48). It no longer bounces, and still retains some lag. Mechakoopas cling onto the opponent it makes contact with, which means that it will detonate on them even if they're being knocked away as they got triggered. This also allows for reliable kill setups, with the mechakoopa exploding after the opponent is launched, causing the explosion to be much closer to the blastzones. The Mechakoopa explodes upon hitting a shield if thrown. The Mechakoopa deactivates and lies on the ground when it walks into a shield. It can still be picked up and used before it completely disappears after a second passes. Shadow Mario Paint is active for a shorter amount of time. Neutral attack 2 deals more hitstun, allowing it to connect into the rapid jab more easily. Moves that hit the Junior Clown Car deal 0.88× damage, whereas those that hit Bowser Jr. himself will deal 1.15× damage. The Junior Clown Car's hurtbox takes priority over Bowser Jr.'s hurtbox. 2% The Junior Clown Car performs a one-two combo, followed by a flurry of punches, followed by a jab. It has impressive damage racking potential, as it can easily deal around 20%. Its first hit is quite useful for jab locks due to its minimal ending lag, whereas its last hit's extremely high knockback growth can KO around 130%-150% while near the edge. However, its neutral infinite is quite easy to escape, even with minimal SDI, while its last hit is punishable. As a result, it is best used against off-stage opponents that are attempting to grab the edge. 8% (sweetspot), 6% (sourspot) The Junior Clown Car thrusts a pitchfork forward. It can be angled and is very useful for spacing. 6% The Junior Clown Car thrusts a pitchfork upward. It can combo into itself beginning at 0% and juggle at medium percentages, but has a blind spot between the fork's prongs and the Junior Clown Car. 2% (hits 1-2), 6% (hit 3) The Junior Clown Car uses its tongue to lick forward three times. It has a fair amount of utility, as it is efficient at warding off rushdowns, can act as a set-up for a dash attack, or interfere with an opponent attempting to grab an edge due to its undulating hitbox. 1.8% (hits 1-5), 4% (hit 6) The Junior Clown Car opens its mouth to swing a Grinder twice. Its loop hits do not connect together very well at high percentages. Smash Twin Drills 1% (hits 1-5), 11% (hit 6) The Junior Clown Car uses two drills to drill the opponent in place. The final hit is a powerful KOing option, while the whole move has low ending lag and it can be angled. 1% (hit 1), 1.3% (hits 2-4), 2.3% (hit 5), 6% (hit 6) Bowser Jr. performs a handstand to attack with the Junior Clown Car's spinning propeller. It is Bowser Jr.'s fastest smash attack, with its multiple hits being useful for pressuring shields or denying aerial approaches. 18% The Junior Clown Car slams wrecking balls on both sides. 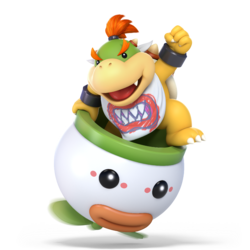 It is Bowser Jr.'s most powerful smash attack, and is the third strongest down smash in the game, making it deadly for punishment. However, it has high ending lag unlike his other smash attacks, making it equally as punishable. 8% (clean), 7% (mid), 5% (late) The Junior Clown Car spins around with the boxing glove arms extended. It is a weak but useful aerial, which combos reliably from Clown Kart Dash and is effective as a anti-pressure and edgeguarding option. 11%/9% (clean), 8%/6.5% (mid), 5%/4% (late), 2% (landing) The Junior Clown Car swings a wrecking ball forward in a circling motion. Landing while the wrecking ball is still out produces another hitbox, which can lead to more follow-ups on the ground, as well as compensate for its high landing lag. Useful for edge-guarding and spacing, as well as a viable KOing option. 14% (clean tip), 8% (clean base, late) The Junior Clown Car thrusts a wrecking ball backward. Like his forward aerial, landing while the wrecking ball is still out produces another hitbox, which can lead to more follow-ups on the ground. Useful for edge-guarding and a viable KOing option due to its high knockback. 10% (clean), 6.5% (late) Swings a hammer above himself. It has little lag and is a useful juggling option. 1.5% (hits 1-8), 2.5% (last), 2% (landing) The Junior Clown Car extends a drill from its underside hatch to pierce opponents. Its high ending lag is compensated by the hitbox it produces upon landing, which grants it follow-up potential. If the attack hits an opponent, it can cancel quickly into other moves; if not, Bowser Jr. suffers from moderate ending lag. — The Junior Clown Car extends a claw to grab the opponent. A slow grab overall. 1.3% Hits the opponent with a toy hammer. A fairly fast pummel. The toy hammer looks identical to the one used in the Eekhammer sticker from Paper Mario: Sticker Star. Each hit plays the recurring sound of Mario jumping onto a Goomba in the Super Mario franchise. 3% (hit 1), 7% (throw) The Junior Clown Car throws an uppercut. It is fairly good for launching opponents at the edge for an edge-guard. 11% The Junior Clown Car spins and then throws the opponent backward. Bowser Jr.'s most powerful throw, as it can KO most middleweights starting around 160% without rage. 7% The Junior Clown Car flings the opponent upward. It can lead into up aerial at low percentages. 1.2% (hits 1-7), 4% (throw) The Junior Clown Car throws the opponent onto the ground and then extends a drill from its underside hatch to pierce opponents. It can be used to pressure the opponent into his Clown Kart Dash. 6% Gets up while spinning a pair boxing gloves outstretched on both sides. 7% Gets up while spinning a Grinder around himself. 5% Gets up while thrusting a pitchfork on both of sides. 10% Slams a pair of wrecking balls while climbing up. Clown Cannon 10% (uncharged), 7% (uncharged late), 20% (fully charged), 14% (fully charged late) The Junior Clown Car opens its mouth and fires a cannonball. It can be charged to increase the cannonball's speed and power. At the end of its path, the cannonball will drop to the ground, which can hit opponents attempting to recover if it is spaced properly. However, it has high overall lag. Clown Kart Dash 4%+speed (collision), 8% (doughnut) The Junior Clown Car transforms into a go-kart that speeds forward. Tilting the control stick/circle pad in the opposite direction or pressing the attack/special button will cause the Junior Clown Car to perform a doughnut, which deals more damage and has higher knockback to opponents on contact compared to simply charging into them. Spinning out in the air can produce horizontal movement, after which it can be used again. All versions of the move can be jump canceled, even right after hitting an opponent, which can lead into combos and mix-ups. Abandon Ship! 5% (contact), 13% (explosion), 15%/10% (hammer) Bowser Jr. ejects himself from the Junior Clown Car. The Junior Clown Car slowly falls to the ground and then explodes with high power when the move is used in midair, whereas it will simply explode after a brief period when used on the ground. When Bowser Jr. is out of the Junior Clown Car, he is not rendered helpless and can still attack with a hammer (or in the case of the Koopalings, their respective wands), which is powerful enough to KO at medium to high percentages. However, taking any weak hit while out of the Junior Clown Car prevents another use of the move without button mashing or landing. Mechakoopa 2% (contact), 7% (explosion) The Junior Clown Car drops a Mechakoopa from its underside hatch. The Mechakoopa falls in a strong downward arc; once it lands, it starts walking around. If it reaches a wall or dead end, it will turn around and walk in the opposite direction. If it makes contact with an opponent (or travels enough distance in the air without landing), it will detonate. Lastly, if enough time passes and they have not hit an opponent yet, they will spark out and detonate automatically. They can be picked up and thrown as items either by Bowser Jr. or his opponent. Shadow Mario Paint 3% (paint), 5% (explosion) Bowser Jr. transforms into Shadow Mario and uses the Magic Paintbrush to paint a giant, orange X on the screen. Anyone caught in the X's hitbox will be damaged, with the X pulling opponents into it once they are hit. The X will clear away with an explosion after some time. The sheer size of the X makes avoiding damage from this Final Smash difficult, similarly to Iceberg. Flies onto the stage in the Junior Clown Car and makes a taunting facial expression toward the camera. Up Taunt: Jumps up, sits on the edge of the Junior Clown Car, and makes a tiny breath of fire, chuckling. Side Taunt: Twirls a hammer, or in the case of the Koopalings, their respective wands. Down Taunt: The Clown Car spawns its wheels and performs a donut, then returns to normal. Hops impatiently in the Junior Clown Car. Jumps out of the Clown Car, hops in celebration a few times, then poses. Drives the Clown Car around like a go-kart, then stops and pulls out a hammer (or a wand, if playing as a Koopaling). Gets out of the Clown Car and rubs it with his right hand. A music piece based on the same melody as the Mario victory theme, but instead of a standard orchestral arrangement, the piece is played with slightly distorted electric guitars. It also sounds similar to the level clear theme of Bowser's sidequests in Paper Mario: The Thousand-Year Door. Classic Mode: Mama Peach, Where Are You? All of Bowser Jr.'s opponents are princesses, some of which are teamed up with their love interest (or in Lucina's case, her father). 5 Mii Fighters (x6) Peach's Castle Main Theme - Super Mario 64 The Mii Fighters all wear princess wigs. Although Bowser Jr. does not appear in the World of Light opening cutscene, he was vaporized and later imprisoned alongside the rest of the fighters (sans Kirby) when Galeem unleashed his beams of light. 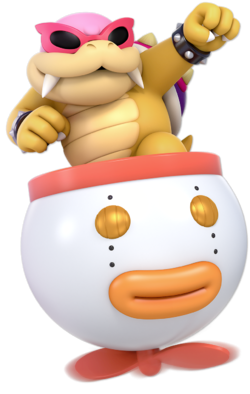 Bowser Jr. was one of the many fighters that fell under Dharkon's control upon Galeem's first defeat. He is found in one of two alternate pathlines on the Triforce of Power segment of the Sacred Land sub-area, guarded by various Legendary spirits. Bowser Jr.'s Fighter Spirit can be obtained by completing Classic Mode. It is also available periodically for purchase in the shop for 500 coins. Unlocking Bowser Jr. in World of Light allows the player to preview the spirit below in the Spirit List under the name "???". As a Fighter Spirit, it cannot be used in Spirit Battles and is purely aesthetic. Each Fighter Spirit has an alternate version that replaces them with their artwork in Ultimate. Bowser Jr. also appears as a primary spirit in the form of Shadow Mario. Additionally, due to being alternate swaps, each of the Koopalings possess their own Fighter Spirits. •Tiny Bowser (×8) Grab 3,400 Mushroom Kingdom N/A •Defeat an army of fighters Ground Theme - Super Mario Bros.
•The enemy has increased attack power after a little while Inkoming! 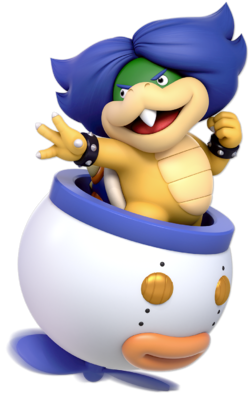 Instead of alternate color schemes, Bowser Jr.'s alternate costumes consist of the Koopalings. 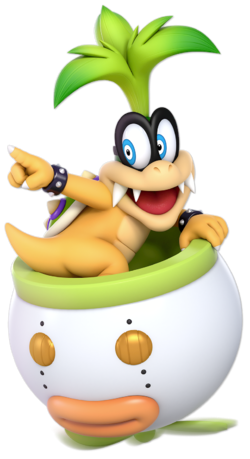 Bowser Jr.'s Junior Clown Car is the only one with black eyes and horizontal orange "eye paint", while the Koopalings' Clown Cars have yellow mechanical eyes with vertical black "eye paint". All of the Koopalings have their own models and voice clips. Bowser Jr. idling on Onett. Charging his forward smash on 3D Land. Performing his dash attack on Princess Peach's Castle. Jabbing at Villager on Boxing Ring. Performing his forward tilt towards tempura shrimp on Tomodachi Life. Roy, Iggy, Larry, and Ludwig on Wuhu Island. Taunting with Lemmy, Wendy, and Morton on Tomodachi Life. Idling next to Snake on Tomodachi Life. Struck by Alucard on Castle Siege. The "Everyone is Here!" trailer features a visual glitch: when Lemmy uses his down taunt, his face disappears for a few frames at the end of the animation. The Junior Clown Car also shows a visual glitch, with two mouths overlapping each other when Ludwig is seen falling off a ledge. In Bowser Jr.'s showcase video, at one point the seven Koopalings follow Jr. in the same order they are fought in New Super Mario Bros. U. Despite the fact that Bowser has his own sub-world in World of Light, Bowser Jr. is fought in the Sacred Realm. The render of Lemmy resembles artwork of him from New Super Mario Bros. U, and he is the only Koopaling to be completely out of the Junior Clown Car. Similarly, the render of Wendy resembles an illustration of her from Super Mario World. 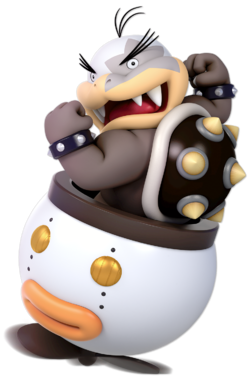 Bowser Jr. is the only fighter whose alternate costumes all have different names and voice clips. Bowser Jr. is one of six characters to use their default costumes in certain Spirit Battles, the others being Yoshi, Mr. Game & Watch, Inkling, Robin, and Joker, though the latter three are only through DLC. This is not counting Alph and gender swapped characters. Despite that, there's no proper battle against a default Bowser Jr. in World of Light outside of himself because the only Spirit Battle in which he is present (Shadow Mario) is absent, instead finding puppet fighters of the Koopalings. The only exception to this are the false Bowser Jr.s created during battles involving Dharkon. Additionally, Ludwig is the only Koopaling not present in any spirit battle. 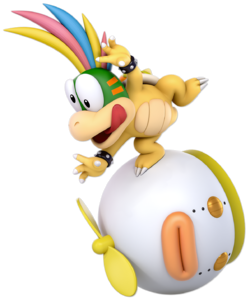 Prior to version 1.1.0, Bowser Jr.'s airdodge behaved exactly how it did in Smash 4 when using it out of Abandon Ship!, making him the only character to have been capable of performing multiple airdodges without touching the ground or getting hit in any version of Ultimate. Bowser Jr. is the only character who travels to Delfino Plaza in Classic Mode. This page was last edited on April 18, 2019, at 11:57.